The Monroe County Health Board met last Tuesday night at the Monroe County Annex Building in Waterloo. Discussion of a possible urgent care facility took up most of the two-hour session. Monroe County Health Department Administrator John Wagner opened the discussion, noting that his initial guidance had been to explore establishing such a service in Waterloo under a contract with an existing urgent care group. The original idea was to better serve the medical needs of Medicaid patients and those without adequate insurance, he said. However, Wagner said recent concerns indicated a need for a more thorough discussion of several factors, including level of need; how such a facility would fit into the county’s overall health needs; and potential issues of unfair competition with private medical practitioners. Difficulty determining the demographics of this need was noted first. While there has been anecdotal evidence from people calling or visiting the health office indicating they could not find doctors willing to serve them, the accuracy of this as an indication of a broader need was questioned. While fellow board member Ellen Gates said this county offers neither a hospital nor urgent care facility, another board member, Dr. Michael Kirk, pointed out that citizens are within 30 minutes of four major hospitals in the region: Red Bud Regional Hospital, St. Elizabeth’s Hospital and Memorial Hospital in Belleville, and St. Anthony’s Medical Center in St. Louis County. He also told how he originally practiced in western Kansas in an area in which the closest hospital was 270 miles away in Denver. Kirk also offered an analysis by the Illinois Health Commission that notes Monroe County is not now, nor has it been for many years, on their watch list for any lack of medical service availability. As the discussion continued, in addition to questions of who and how many would be served, the more basic issue of what the health department’s role should be arose. 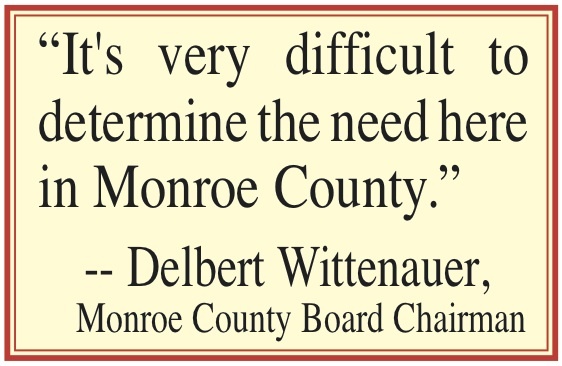 At the conclusion of the discussion — which also accepted comments and questions from members of the public — Wittenauer moved that the board should not pursue a contract for an urgent care facility at this time, but rather it should better address the issues of need and proper role of the county in meeting any need identified. The board also discussed the status of an emergency power generator recently acquired from the county for the Annex Building. It was noted that the generator, which is available because it has been assessed as inadequate to power the entire Monroe County Courthouse, where it is currently located, has not been tested since it was removed from the old nursing home. Wagner said he would check into the proper procedure for preparing it for use. It will provide emergency power to the Annex, especially to support Monroe County EMS, which is also housed there. The county is anticipating receiving a generator with adequate capacity to serve the entire courthouse under a federal program.